Urticaria means an allergic reaction that causes red raised skin rashes that are extremely itchy. Urticaria also refers to Hives, weals, welts or nettle rash. When body reacts to any allergens (substances that produce allergies), it releases histamine. Histamine is a protein that triggers our capillaries to leak fluid. This fluid then accumulates under the skin and manifests itself as a red raised rash on the skin. 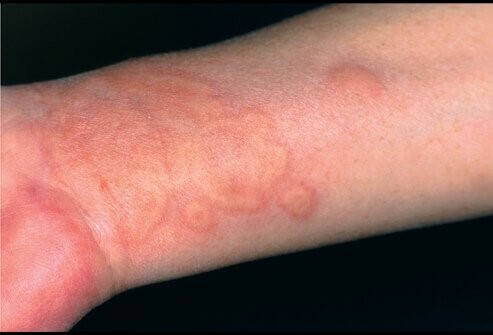 These raised weals are characteristic symptoms of Urticaria. Urticaria (Hives) is a noncommunicable disease, so it doesn’t spread through contact. 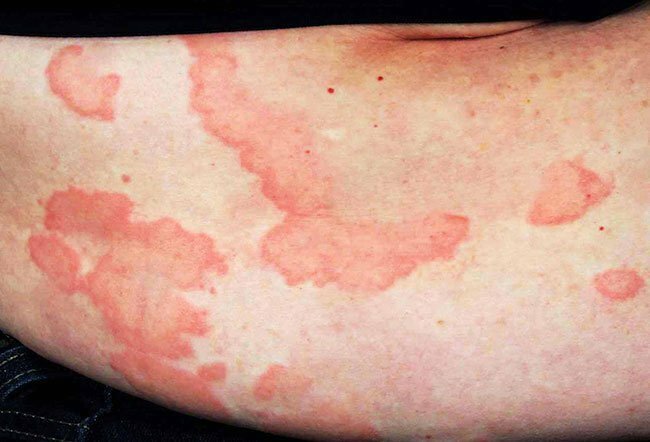 A characteristic symptom of Urticaria is the raised red rashes that vary in size and are usually itchy. The rashes may be small and isolated or may join together to cover larger areas of skin. Then they are called plaques. Urticaria rashes may appear on any part of your body such as arms, legs, back, face, lips, tongue, and throat. The rashes may fade away in a few hours or in a few days. The basic cause of Urticaria is the release of histamine from the capillaries in the skin. These tiny blood vessels have specialized cells called mast cells that secrete histamine, a chemical that is a vital part of our local immune system. It is secreted whenever our body encounters a foreign pathogen or any other allergy trigger. Thus, having Urticaria means that your body’s immune system got triggered by an internal or external stimulus. There are two main types of Urticaria depending upon the duration for which the symptoms last. Let’s look at some of the triggers that may cause Urticaria in some persons. Certain medications such as NSAIDs, ACE inhibitors, and painkillers. 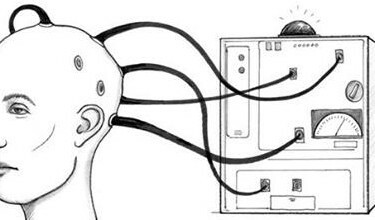 The symptoms last for more than six weeks. It’s not known what causes chronic urticaria. Most of the times, the cause remains unknown; however, patients with hepatitis, thyroid disease or cancer may develop chronic urticaria. Since it’s a long-term disease, it may affect the lungs, gastrointestinal tract or muscles of the affected person resulting in diarrhea, vomiting, soreness of muscles and shortness of breath. Treatment of urticaria is symptomatic and mostly consists of antihistamines most of which are available over-the-counter. Topical therapies are available but mostly ineffective. They are taken not to treat the condition but to reduce the itching and discomfort. This essentially means that for the most part, urticaria is a highly annoying temporary condition that goes away on its own and requires only symptom management.